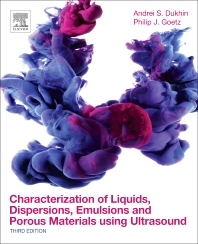 Characterization of Liquids, Dispersions, Emulsions and Porous Materials Using Ultrasound, Third Edition, presents a scientific background for novel methods of characterizing homogeneous and heterogeneous liquids (dispersions, emulsions, and gels) as well as porous materials. Homogeneous liquids are characterized in rheological terms, whereas particle-size distribution and zeta potential are parameters of heterogeneous liquids. For porous materials, porosity, pore size, and zeta potential are output characteristics. These methods are based on ultrasound, which opens an opportunity for simplifying the sample preparation by eliminating dilution. This in turn, makes measurements faster, easier, precise, suitable for accurate quality control, PAT, and formulation of complex systems. This book provides theoretical background of acoustics, rheology, colloid science, electrochemistry, and other relevant scientific fields, describing principles of existing instrumentation and, in particular, commercially available instruments. Finally, the book features an extensive list of existing applications. Dr. Andrei S. Dukhin is CEO and Co-Founder of Dispersion Technology, Inc., NY. He has been a leader in the development of a new technology for characterizing complex liquids that employs ultrasound for characterizing interfacial chemistry, particle size, and rheological properties of said systems. Dispersion Technology has sold 500 instruments based on these principles in 30 countries. Philip J. Goetz has an Electrical Engineering bachelor degree (MIT) and an MS in Computer Science (New York University). Between 1960–1970, he was an Engineering Group leader developing doppler radar technology for military airborne navigation and image recognition hardware for airborne terrain guidance. He has been President, chief scientist and founder of a new venture for developing electro-optical instrumentation for characterizing the zeta potential of dilute colloids. From 1996 – 2010 he was Chairman and co-founder of Dispersion Technology for the development of ultrasound instrumentation for complex characterization of concentrated colloids.